These should be heady days for Israel. The world is awakening, at long last, to the true villain in the modern history of Islamic medievalism and ignorance: the corrupt Arab ruling class. The rejectionist front dictators of the Arab world are either under siege or already fallen, and the horrifying crimes they have for decades committed against their own people have been exposed. The international community, armed with this new evidence, could in theory draw the surprising conclusion that Israel may not be the root cause of all the world's conflicts after all. The United States believes that negotiations should result in two states... The borders of Israel and Palestine should be based on the 1967 lines with mutually agreed swaps, so that secure and recognized borders are established for both states. The Palestinian people must have the right to govern themselves, and reach their potential, in a sovereign and contiguous... non-militarized state. The pro-Israel community has reacted strongly, but the plain fact is that the President's remarks were neither surprising nor novel. Yes, it's true: Mr. Obama did make reference to the hated, illegitimate, and (in Prime Minister Netanyahu's words) "indefensible" 1949 armistice lines (commonly—but misleadingly—referred to in diplomatic and media circles as the "1967 lines"). But pundits seem to have overlooked the fact that he qualified his statement carefully, carving a vitally important semantic safe harbor. As my son has observed, the phrase "with mutually agreed swaps" essentially leaves every option open. 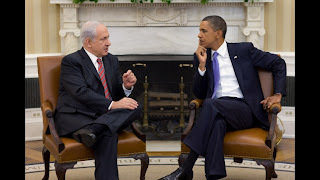 Although Jewish groups had mobilized against the President's invocation of the armistice lines in the days leading up to the speech, it is difficult to ask the leader of the free world to be more conservative in his dealings with the Palestinians than the Israelis themselves have been. If this President, or any other, is seen as a hostage to Israeli policy, his effectiveness—and, ultimately, his ability to wield American leverage to Israel's advantage—will only be weakened. So what, if anything, was new in Mr. Obama's message? To my ears, the real novelty was the use of the phrase "non-militarized" in referring to the future Palestinian state. Ultimately, if one believes, as indeed most Israelis do, in a two-state solution, one can hardly expect a better outcome than "mutually agreed" borders and a "non-militarized" Palestine. It's also useful to review what the President did not do. He did not summon the parties to negotiations. He did not issue new peremptory demands on Israel, as he disastrously attempted to do in 2009. He did not threaten that a solution would be imposed by the United States; in fact, he said quite the opposite. And, ultimately, he did no harm to Mr. Netanyahu, who is certainly going to reap political rewards at home for his direct and immediate dismissal of the President's vision. Mr. Obama's real mistake is not in his formulation but in his focus. This should be a time of great hope. The long-suppressed bill of grievances of the Arab everyman has finally been aired, and there is nary a word about Israel. Poverty, ignorance, and oppression have been revealed as the essential casus belli of the Middle East, not the presence a few million Jews on a narrow strip of previously neglected real estate. Now is not the time to bury the lead of Arab self-liberation within the mythology of Israeli misbehavior. In trying to make history, Mr. Obama has instead misjudged it, shining a light on Israeli/Palestinian discord just as it was becoming clear how small a role that conflict actually plays in the larger tragedy of the Arab Middle East. Does anybody remember what the President said about Iran in his address? About Syria? Egypt? Has there been any coverage at all of any topic raised by Mr. Obama in three-quarters of an hour of continuous speaking besides the Israeli/Palestinian matter? Through his insistence on dredging up that issue, Mr. Obama gave the remaining strongmen of the Arab world the one gift they most wanted: an alternative target for the world's reprobation. You're welcome, Muammar. The drama will continue to play out this weekend at the AIPAC Policy Conference in Washington, DC. With 10,000 supporters of the American-Israel relationship in attendance, President Obama and Prime Minister Netanyahu will each have an opportunity further to lay out his vision for peace and security for Israel and the region. Netanyahu is guaranteed a warm and welcoming reception, but, having chosen this time to refocus on Israel, the President will have to work hard to win over an audience understandably suspicious of his priorities. This is a nine-year-old piece I was planning on reposting on Sept 11, 2011. But in light of this week's events, I feel that now would be the right time. It was originally published in the Jewish Journal (LA and Orange County Editions) on the occasion of the first anniversary of the September 11, 2001 atrocities. 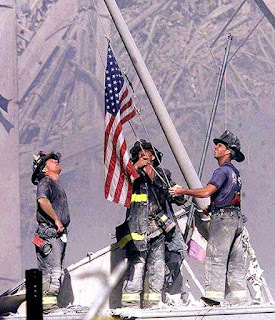 Although I was there, I can't tell you much about the events of Sept. 11, 2001, that you don't already know. After all, you had CNN; I only had my two eyes and the prescription lenses I thankfully remembered to grab as I fled the apartment. Yes, I watched from a few blocks away as the towers fell, but without the benefit of a zoom lens or slow motion video (thank God for that—there was nothing that I saw I wished to see again or in greater detail). Indeed, the overwhelming personal tragedies and the incredible acts of heroism have been recorded and retold. I cannot add to them. But I can tell you one story, a small one, about two brothers from Long Beach who found themselves that morning on opposite sides of a river. A decade ago, my wife, Jackie, and I returned to Southern California from New York City, where we had lived for five years. I continued to make frequent business trips there. On the bright, clear morning of Sept. 11, I lazed sleepily in the apartment my company keeps in lower Manhattan. I was alone. My brother, with whom I share the place when I come to New York, had an early plane to catch, and had left a couple of hours earlier. As I debated whether or not to get up and shower, he was sitting in the terminal at Newark Airport waiting for his Atlanta flight to be called. At the next gate, passengers lined up to board United Flight 93, bound for San Francisco. Randall casually watched them embark; he would be one of the last to see them alive. Within minutes of the first attack, my building was evacuated. I stood in the park, 37 floors below my apartment window, with my eyes squinting against the sunlight, my heart racing, my mind recoiling, rejecting the evidence of my senses. As the first tower fell, I was speaking with Jackie on my cell phone, reassuring her that I was alright, although she surely knew otherwise from the sound of my voice. I stood, a couple of hundred yards from the billowing smoke, trembling and terrorized. Randall watched helplessly from the airport, from which the towers were... had been... clearly visible. Stunned, I began wandering the city, dazed and aimless. Randall, however, had the opposite reaction: he was galvanized, committed and determined to find a way back into Manhattan. His goal was to reach me and make sure I was OK.
Like me, Randall grew up in Long Beach, attended Jewish day school and celebrated his bar mitzvah at Temple Beth Shalom. Unlike me, though, he never left the neighborhood until the day I asked him to come work with me. Within a couple of weeks, he was setting up an apartment on Manhattan's Chambers Street, learning the subway system and discovering ways to have videos and snack food delivered on demand via the Internet. By Sept. 11, my brother had been working with me for three years, spending about one week a month in Southern California and the rest of the time in New York City. And so it was that morning, as about 8 million people worked desperately to leave Manhattan as quickly as possible, Randall focused his considerable ingenuity and sales ability on doing just the opposite. The obstacles to reaching this goal were fairly considerable. Of course, all of the usual routes into Manhattan—subways, ferries and bridges—were closed. River traffic was warned away from the city's many docks. Randall, through a combination of persuasion, bribery and alert observation, finally reached Manhattan's Upper West Side. Like our great-grandparents over a century earlier, he arrived on the island without a dime in his pocket. He set out on foot for SoHo, about 3 miles away, where he found me a couple hours later. I was shaken, but fine. He was exhausted, but fine. I was relieved to have him with me. We spent the rest of the week together before finally coming home. Our flight was on Rosh Hashana; as Randall said at the time, "It's not a problem. God is on vacation this week." Soon it will be Rosh Hashana again. The High Holiday prayerbook, the Machzor, includes the words "These things I will remember." 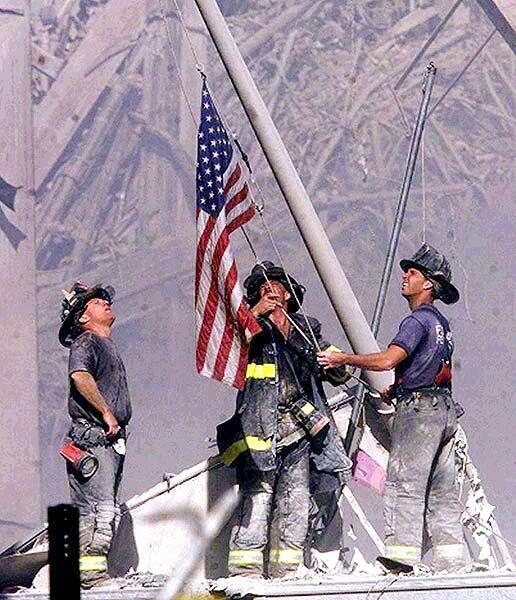 I carry hundreds of memories of Sept. 11, 2001, many of them terrifying that I would gladly be rid of. But I will also remember that somebody crossed a blockaded river and walked half the length of a city just to look in my eyes, to be reassured that I was OK.